Hands-on learning took on a new meaning when Indiana State students Ashley Burkett and Ron Taylor explored the depths of the ocean as part of a research cruise to Costa Rica. 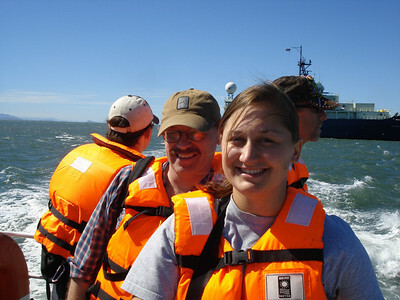 Burkett and Taylor, together with Tony Rathburn, associate professor of geology at Indiana State, and scientists from Scripps Institution of Oceanography, the California Institute of Technology and other locations around the world, spent seven days at sea off the coast of Costa Rica on a National Science Foundation-funded expedition, exploring newly discovered environments of the underwater world. The team of scientists used a manned submersible called Alvin to collect hundreds of samples from the ocean floor at water depths of about 1000 meters. 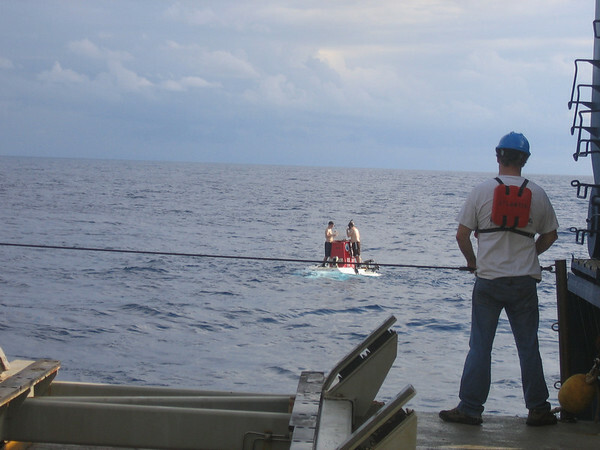 "We were able to discover and sample environments on the sea floor that have not been examined before," Rathburn said. 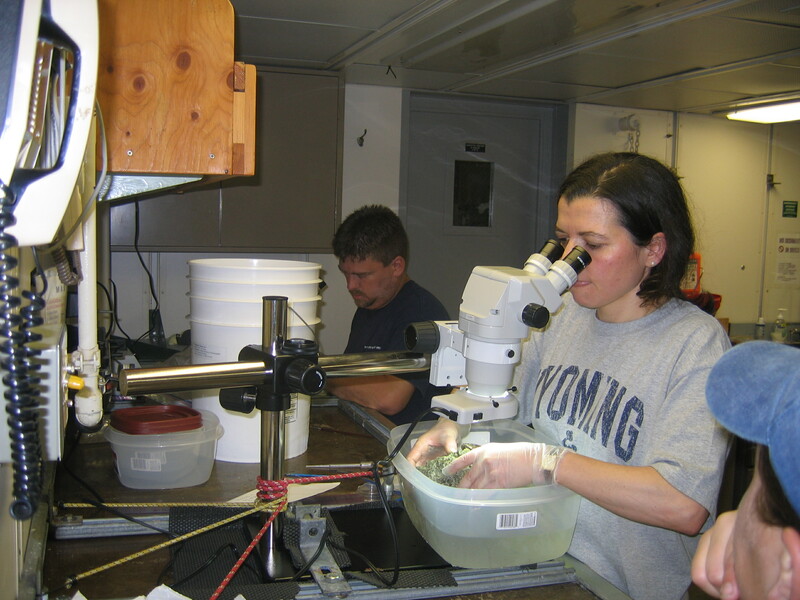 They gathered information and samples and recovered seafloor experiments that they deployed last year in order to examine the differences between creatures that colonize rocks, clamshells and tubeworms in areas where methane seeps out from the seafloor sediments and those creatures that live nearby in non-seep habitats. They also collected sediment cores from bacteria mats, located on the sea floor. The bacteria that make these mats thrive on the fluids from the methane seeps and are among the largest bacteria in the world. Burkett, from Toledo, Ohio, a graduate student in the new ISU Department of Earth and Environmental Systems, plans to use the research from this trip for her thesis, which focuses on benthic foraminifera, single-celled creatures that secrete a shell-like skeleton and live on the ocean floor. Taylor, a senior geology major from West Terre Haute, Ind., plans to attend graduate school and study the Western Antarctic Peninsula. He said the experience he gained from this trip will be beneficial to future cruises. "As an undergrad, I am conducting graduate level research," Taylor said. "That is one of the advantages of being here at Indiana State." Though looking through a microscope may not be difficult in a lab, it tends to be a bit more challenging while on a rocking, moving boat, Burkett said. Looking through the lens of a microscope or camera can often cause seasickness. By using petri dishes designed to minimize the rocking motion of the ship, Burkett was able to examine numerous samples while at sea. "The information we obtained from the trip will enable us to figure out the ecology of creatures that inhabit hard substrates," Rathburn said. Elena Perez, a researcher from the Natural History Museum in London, also dove in Alvin on the last dive of this expedition. Perez has worked with the ISU team on several foraminifera projects and was able to collect samples from a new type of methane seep on this trip. "As a deep sea researcher, I am used to seeing the animals I study in the lab, but being with them in their habitat gives a different perspective and provides a better understanding of how the environments we are studying work," said Perez, who was the dive leader for the first time. "It is also very exciting to feel that you're at the edge of new discoveries." Graham Nash, a doctoral student at the Australian National University, who previously worked with Rathburn in Australia, was one of the researchers on the trip who is also studying foraminifera. Nash was able to dive in Alvin for the first time and was amazed at what he saw. "As you descend, or more appropriately sink, you are just filled with a sense of adventure," Nash said. "Things rapidly become very dark outside, but then a point arrives where the view through your little window is filled with little flashing dots and clouds of light, as bioluminescent creatures drift, or actively swim, in their own alien world.... Some are vaguely recognizable as prawns or shrimp. Some are little fish with electrically vibrant stripes, while others are simply amoeba like bioluminescent masses - amazing stuff." He compared the ocean to a "vast, dark and very cold desert." Nash enjoyed working with Burkett, Taylor and Rathburn, both onboard the ship and onshore in Costa Rica. "Research is definitely about inquisitiveness and the ability to generate new ideas, questions and angles, so being locked on a ship with a whole bunch of enthusiastic researchers who have been thinking about their cruise and their objectives for the last 12 months is inspiring to say the least," Nash said. That interaction among scientists is only part of Rathburn's reason for taking students to the depths of the oceans. "Exposure to internationally known scientists and hands-on training using the latest technologies to collect remote samples from the deep sea provided valuable experiential learning for marine science students from all over the globe," Rathburn said, "including those from Indiana." Cutline: Alvin, the manned submersible, prepares to descend to the ocean floor to collect samples. Courtesy photo. Cutline: Ashley Burkett, graduate student, and Tony Rathburn, associate professor of geology, off the coast of Costa Rica on a research expedition. Courtesy photo. Cutline: Elena Perez, a researcher from the Natural History Museum in London, and Ron Taylor, a senior geology major from West Terre Haute, examine samples brought up by the manned submersible. Courtesy photo. Students spend seven days at sea off the coast of Costa Rica on a National Science Foundation-funded expedition, exploring newly discovered environments of the underwater world.